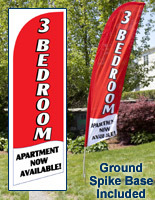 The Move-In Special Swooper Flag is Designed Affordability and Durability! A Ground Spike Base Comes with Each Unit! 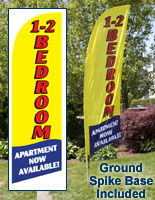 The Move-In Special Swooper Flag Sells at Very Inexpensive Prices! Steel ground spike base included for posting in yards and along driveways. Black nylon bag comes with the flag to facilitate organized transport. Aluminum and fiberglass pole is affordable and bows in the wind. Knit, polyester fabric is very lightweight to flutter in the wind. 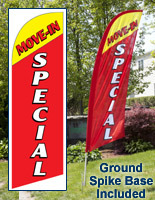 This MOVE-IN SPECIAL swooper flag will keep your properties filled to maximize rental income! What makes this feather banner so effective? 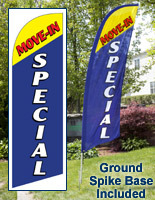 First and most important, this MOVE-IN SPECIAL swooper flag is simply more visible than typical real estate displays. 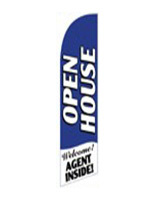 A ground spike base comes with each unit so property managers, agents and brokers can strategically place the banner in front of a rental office, along a road, or in a lawn. The "MOVE-IN SPECIAL" swooper flag that flutters is 8' tall once placed on the base. 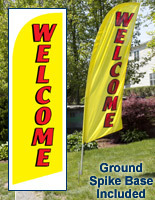 An ultra-lightweight, knitted polyester construction allows these banners to flutter in the wind for added attention. 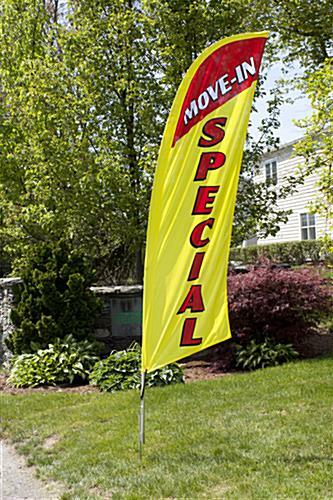 The "MOVE-IN SPECIAL" swooper flag that flutters is multi-colored to attract the maximum possible amount of attention from those driving by. This display has a long list of convenient features in addition to being highly effective at filling vacant apartments, flats and houses quickly. 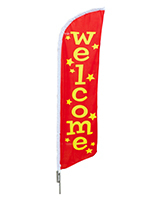 This feather banner is a "MOVE-IN SPECIAL" swooper flag that comes with a bag for transport and storage. All the components of this display fit compactly in the black nylon carrying bag. 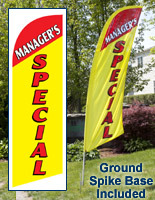 This promo pennant, "MOVE-IN SPECIAL" swooper flag have poles consisting of (2) aluminum and (2) fiberglass segments. 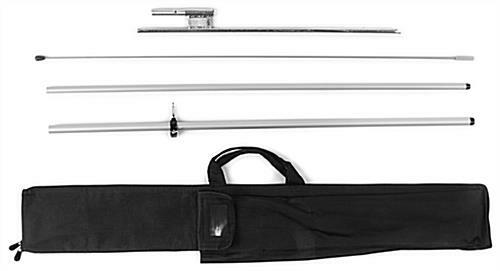 Pole components detach from each other and each section has its own storage compartment within the nylon bag. The bag also has a separate storage compartment for the base of this "MOVE-IN SPECIAL" swooper flag that includes a ground stake. One person can assemble these banners with ease in only a couple minutes. Additionally, since the "MOVE-IN SPECIAL" swooper flag only weighs 4 lbs, anyone can carry the unit to a practically any location. The banner is connected to the pole with a bungee cord that prevents wind from blowing the pennant off once assembled. One would think with an eye-catching design and user-friendly features that these feather flags would sell at a premium. However, this banner sells at a surprisingly low price, which makes it a display that quickly brings a great return on investment!